CHARLOTTE STREET HOCKEY LEAGUE – Metro Charlotte's ORIGINAL co-ed street/ball hockey league since 2010! CSHL Update: It’s (almost) official! As some of you know, there has been a dedicated effort going on behind the scenes to improve the league and its status in the community. We would like to take a little time and update the masses on our efforts. In January we rebranded ourselves as Charlotte Street Hockey League (formerly Charlotte Street Hockey). Along with this subtle name change came the refocusing of our group to an actual ball hockey league instead of a primarily pick-up league (and the occasional tournament). This was implemented to allow us a revenue stream in order to tackle various initiatives. Additionally, with our non-profit status, we will be able to secure sponsorships, participate in community outreach programs in order to strengthen our ties to the area (and as a result build membership), and have a bit more credibility when presenting proposals to local governments for better ball/street hockey facilities (more on that below). I would like to give a huge thanks to league member Imran Farooqi for donating a lot of his time to the legal work that goes into such a process! Next up on the docket is the biggest and most common challenge that we’ve faced in our 8 plus years of existence. That is (let’s say it all together now) finding a place to host league games! I know what you are saying, “but we have pick-up games at the YMCA, why can’t we hold league games there?” Unfortunately, the YMCA does not rent out their facilities to outside leagues or programs (our pick-up games are kind of a cooperative between the league and the YMCA). We have been playing in Huntersville (Waymer Park) off and on since our very first game in 2010 so naturally, this seemed like a good place to start. Recently a few representatives of the league met with the Huntersville parks and recreation department. In short, it went very well. They were very receptive and have a high interest in our concept for improving Waymer Park to make it more conducive to hosting league games (adding fencing to full enclosure of the court, adding sport court surface, etc.) We even recruited one of the maintenance representatives to play with us! This is a huge step forward for the league and we could be just a few sponsors away from getting things done. I would like to thank league member Rob Bini for taking the initiative to draw up the proposals and presenting this to the Huntersville P&R. This will pay huge dividends for us in the future! Once we have a better facility to host our league, the sky is the limit! A better surface will attract more players as their equipment won’t wear excessively, as happens on the current asphalt. Full enclosure of the court will allow more fluid game play as well (i.e. those pesky corners, behind the goals and the player bench area). And while this is all well and fine for us old goats, as Whitney Houston sang, “I believe the children are our future”. A major initiative that we would pursue would be holding youth hockey camps (think “learn to play hockey” programs) and eventually hosting something like a 12U league. With the leadership we have in place and a genuine facility to play in, this will be entirely possible. Lagrange Street Hockey in our neighbor state of Georgia has a focus on youth programs and introducing kids to the greatest sport on the planet. You never know where the next great USBHA or even NHLer will come from! I do want to take the time personally like to thank each player in our Winter 2019 league for taking the leap with us and getting things started. Your league fees went directly to the non-profit application process! I would especially like to thank all 4 of the captains, who happen to be a few of the senior members of the league: Drew Cswaykus, Rob Bini, Jerry Janiga and last but certainly not least, Darren Monaco. Without your help, this first season of the CSHL would not be possible! I would also like to thank all that have volunteered their services this season, be it the thankless job of refereeing, score and timekeeping, or helping set up the court for league games. This has been a true team effort and I love seeing members step up and take initiative! In summary, we are in a great position right now and the future looks bright for the CSHL and street hockey in Charlotte. Let’s keep the ball rolling! We have added a scheduler/stat tracking portal so that players/captains can view upcoming games, league leaders, etc. Lots of things going on behind the scenes here at Charlotte Street Hockey of late. The non-profit application process has begun. This will make us a bit more of a legitimate organization which will allow us to do many things (fundraising, charity work, etc.) along with presenting potential venues with an established league…. …which leads to the third announcement which is that we are changing the name up a bit and moving from a group page to a more “business” like page. The name change is obvious as we want to present ourselves more as a league going forward and the move to business page is mostly for much better analytics and further reach than a regular group page. I’ll need everyone on here that reads this post to “like” our new CSHL page (click here for link). The changeover will be officially January 1st (the group page will be “closed” and new visitors will be referred to the new page.) I’ll be posting in both pages until that date. Thank you all for your cooperation during this transition and keep your eyes peeled for league info soon! 2018 Almost Winter Classic: Captains and Prizes! As you have heard, we nabbed some sponsors this year so now we can give away some decent rewards for a hard fought day of hockey. I would like to again thank our sponsors for their generosity! *Monday November 12th: Runners that have participated in pick-up games this year will be invited. *Sunday November 18th: CSH Opensports members that have NOT played in any games this year will be invited IF all 60 runner positions have not been filled. If they have been filled, I will create a “reserve runners” sign up so that in case some players bow out for whatever reason, we’ll have players to take their place. I will do the same for goalies. The AWC will be FREE as always (donations are always welcome). We will, as we did last year, have a donation jar for the MS Society in memory of Rafael Souffront, for whom our trophy is named. There will be a little incentive this year as each donator will be entered in a drawing to win a prize (at present not sure what the prizes will be yet or how many we’ll have). Also, the winning team will have a slew of prizes bestowed upon them, compliments of our sponsors. Those will be revealed in the coming weeks as will the this years team captains. And the *real* reason everyone looks forward to this tournament…my wife’s almost famous chili will once again make an appearance! Pulled pork and other vittles will also be on the menu. 5 game guarantee (4 round robin + at least one elimination game). 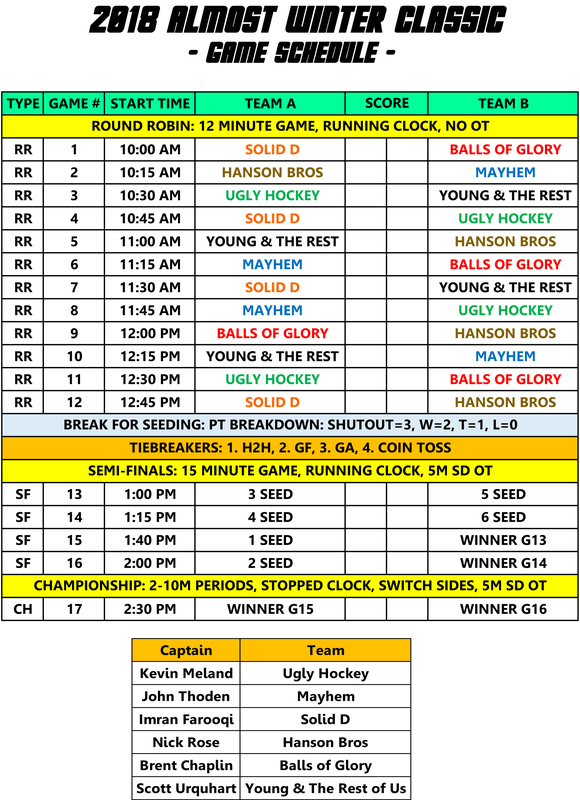 Tourney games will run from 10am until 3pm (“schoolyard draft” is at 9:30 so plan to arrive early). Looking forward to hosting this as always. Please be sure to have your notifications on for Opensports.net! 2018 Almost Winter Classic tournament announcement! Mark your calendar (does anyone actually do that anymore?) for Saturday, December 1st, 2018. It’s hard to believe that the 2018 Almost Winter Classic is only 4 months away! Where has the time gone? As a reflection of how many players we have gained over the last few years, the popularity of our internal tournament/celebration has grown substantially. Popularity is often a double-edged sword so in order to be fair to the players that participate in pick-up games during the year, new criteria for the AWC has been introduced. ONLY members that have signed up on OpenSports.net and have joined our OpenSports group page (link below) will be invited to the 2018 AWC. 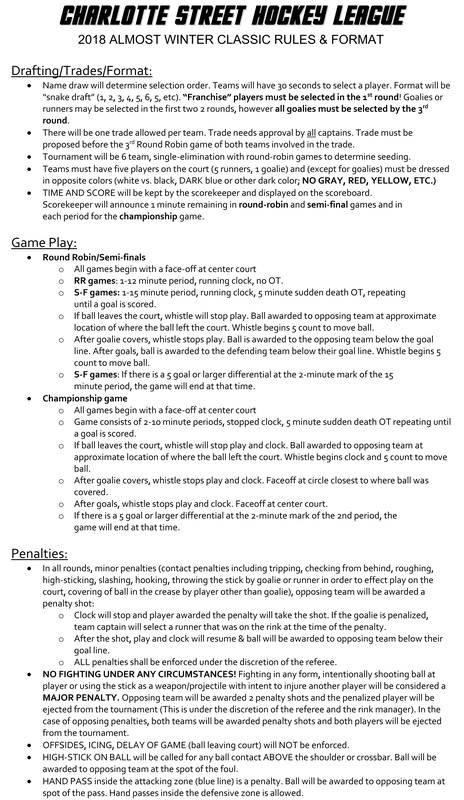 Note that this will not 100% ensure that you will get to play in the tournament (see below). CSH OpenSports group members that have attended pick-up games from January 1st until November 3rd, 2018 will be invited first (along with the 2017 Almost Winter Classic champions if they do not meet the “pick-up attendance” criteria). Both runner & goalie spots will be on a FIRST COME, FIRST SERVED basis as the number of invitees may exceed the number of open spots. A set date for the invite will be communicated so that all will have a fair chance to accept. Initial invitees will have 1 calendar week to accept the invitation. IF there are open spots remaining, a second invite will be sent out to the remaining members of the OpenSports group that have not attended any events this year. As with the initial invite, invitees will have one calendar week to accept. We will also have a “reserve” sign-up in the event that there are attendees signed up that cannot attend. This will be on a first come, first served basis as well. If you are NOT a member of the group on OpenSports prior to the invitations being sent and sign up for an open spot, you will be removed from the sign-up. This also holds true for non-pick-up participants that sign up during the first invitation (no exceptions). We plan on the same basic format as previous years (6 teams, 10 runners + goalie on each team but this is subject to change) so spots will be limited! In summary, if you want to play in the 2018 Almost Winter Classic you will, at the very least, have to be an OpenSports.net member and a member of our group on that website. Also note that active participants in our weekly pick-up games will get first dibs on open spots so do yourself a favor and get off the sidelines and come play sometime!